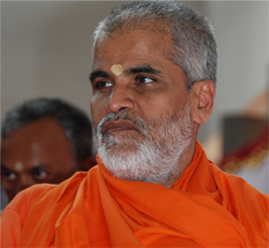 Pujya Swami Brahmananda is one of the senior disciples of Pujya Gurudev, Swami Chinmayananda. Swamiji’s clarity on profound Vedantic truths has made his spiritual discourses popular throughout India. Swamiji has also endeared himself to millions with his mastery in Sanskrit chanting and resonant devotional hymns. Born to a devout family in Pavanje Village in South Karnataka, the making of this spiritual luminary was visible from childhood. Inspired by Pujya Gurudev, the young seeker of knowledge underwent rigourous training at Chinmaya Mission’s Sandeepany Sadhanalaya ashram in Mumbai. After the completion of the intensive three-year Vedanta course, Pujya Gurudev, recognising the brahmachari’s mastery of the scriptures and missionary zeal, asked him to begin conducting spiritual discourses immediately.